While browsing through the list of Dice Tower Network Podcast I stumbled upon The Long View. Not even halfway through listening to my first episode, I became enamored with how Geof Gambil and his guests analyze a game on his podcast The Long View. Not only does he go deep into the theme, mechanics, and strategy, but also opens up the discussion to how the games places among its peers and society at large. So I am quite happy he is able to stop by and talk with me today. Dr. Wictz: Greg, can you give a quick overview about The Long View for people not familiar with it. Geof Gambill: The Long View is a show that is designed to examine and critique a single game each episode. Usually, the game is one that I have played many, many times, or it is a game my guest would be considered an “expert” in. We take the time to try to discuss all aspects of the game from its graphic design to strategies and playing tips. The episodes are usually considered exhaustive and, I hope, somewhat authoritative. A game is never featured or discussed after a single, or few plays. There’s enough of that out there already. I am trying to fill the need for more in depth, critical analysis of games. Dr. Wictz: Did you consider any other name for your show other than “The Long View”? Geof Gambill: The only other contender was 10 and Up. The idea there was not to review a game unless I had played it 10 times or more. The original concept was for it to just be me, talking about games I had played 10 or more times. Dr. Wictz: Why didn’t you stick with that format? Geof Gambill: I was lucky enough to find that there were many people who wanted to be on the show, so I decided to put myself more in the host chair and let other’s lead the way. This had the benefit of making the show broader in scope, potentially, and appeal since I did not have to be the expert to do a show about a game that someone else was passionate about and familiar with. Dr. Wictz: Why did you settle on the name “The Long View” instead of 10 and Up? Geof Gambill: Eventually, I decided against the name 10 and Up because I was concerned people would think the show was about kid’s games or something like that. The Long View jumped to mind as an alternative, and an artist friend of mine came up with the logo which sold me on the name as much as anything else! Dr. Wictz: What inspired the format for The Long View? Geof Gambill: If by format you mean the casual style, I would say it was an old show I watched on PBS years ago with Bill Moyers called Genesis. In Genesis a panel of guests just sat around a table and discussed the book of Genesis from multiple perspectives. I remember the conversation being very organic, dynamic and free form, and I liked that concept for the show. Dr. Wictz: You periodically do a feature looking over all the games released in a certain year. Have you discovered anything about these games they have in common to withstand the test of time? Geof Gambill: I have begun to work on a concept of a great unified theory of game awesomeness (GUToGA). Here’s what I have so far. Games need to offer choice, and multiple paths to victory. Perfect information is often something that will lead to game death as soon as reliable, repeatable strategies emerge (read Puerto Rico here). Some variability and variety is imperative for the long term life of a game. This can be as simple as a semi-random set up, to the judicious use of dice in a game. Games need to offer the player some control over what happens, or ways to mitigate luck, for players to accept randomness. Direct interaction is usually preferred over “multiplayer solitaire” style games. Many of the greats have direct interaction, though this is the most malleable point. Games that stand the test of time often last for 1-2 hours. 3+ hour games can certainly be great and have longevity (i.e. Twilight Imperium 3, Dominant Species etc. ), but these are often viewed as experience games that are often as much about the anticipation of the play as much as the actual experience of the play. Dr. Wictz: I notice you like looking back at older board game, do you see yourself as a historian of board games? Geof Gambill: Not necessarily. I do like looking at older games, but often it is just to examine the roots of a game or its systems, and then exploring just how far and wide the branches have grown since the game was released. Where do I see El Grande in more recent games? What has been done with deck building since Magic: The Gathering? What has been borrowed and why? What ideas in games resonate with players AND designers. These things fascinate me. Dr. Wictz: The way you unpack a single game reminds me of discussions with game designers after playing an unpublished game. Do you also share insights for unpublished games with unpublished game designers? Geof Gambill: Yes. I have been fortunate enough to have done some work for a few of the major publishers as a playtester. I greatly enjoy trying to refine great ideas into something even better. My game group and I have made some contributions I’m quite proud of. I’ve also done my share to sell some designer’s games to publishers who may have been reluctant. Fortunately, the publishers I know are all great people who are willing to listen, and I’m glad that they trust my opinion. It’s gratifying. Now that I’m on the other side of the fence as an aspiring designer, I know just how valuable and important feedback from playtesters is. Dr. Wictz: Where do you find your guest-hosts/game players for the podcast? Geof Gambill: At first, it was just myself and my friends. As time passed, I was lucky enough to have Joel Eddy of Drive Through Reviews join me for many, many shows. He has been a major mentor and very gracious with his time and assistance. He actually hosts my podcast! He’s a good egg, even if he’s wrong about Amerigo! I also have often reached out to users on boardgamegeek who I either know from their contributions, or who are members of the guild. In fact, two of my most frequent guests, Joe Huber and Eric Brosius started a thread requesting episodes they wanted to hear, so I wrote them back and asked, “How about you?”. They were, thankfully, up for it! I have been fortunate so far to never run out of guests and people willing to come on the show. Dr. Wictz: So I take it that you have done an episode upon request? Geof Gambill: Many, many times. I rely often on the audience to tell me what they may be interested in. If I don’t hear from them, I program episodes myself or put out requests for co-hosts on the guild on boardgamegeek. Dr. Wictz: If you were to introduce someone to your show and you could only have them listen to one episode, which episode would you play for them? Dr. Wictz: Is there a board game designer you want as a guest on your show? Geof Gambill: Martin Wallace or Stefan Feld. They are two of my favorite designers. One because of his use of theme and how he integrates the theme into the fabric and mechanics of his games, and the other for the sheer mechanical brilliance of the designs. Guess which is which! They both scratch itches for me that satisfy my diverse tastes. Two of my all time favorites. Dr. Wictz: Geof, thank you again for the interview. If you want to learn more about The Long View Podcast or you happen to be Martin Wallace or Stefan Feld and want to be on the show, you can find Geof @Longviewpodcast on twitter, join The Long View Guild on boardgamegeek.com, or join The Long View Facebook group. Episodes of The Long View podcast can be found on itunes or at The Long View podcast feed. When I used to play Risk with the neighborhood kids the strategy was pre-determined, take Australia and South Africa, or barring that, take North America as fast as I can. The real game was how well I could get the other kids to allow me to do this. Who wins and who loses in Risk is driven by negotiations. I’ll let you have Africa, you let me have South America. If we do not work together then Sam over there is going to take over North America while we fight each other. I still play Risk every once and a while online without anybody talking to anybody, and though the mechanics have not changed, it’s a completely different game. Player negotiations is a game component that adds multiple dimension to a board game. Negotiations opens up options for players as how to pursues their goal. Without negotiations a game of Monopoly is fixed by the roll of the dice as to who gets what. To be honest, if players do not haggle, barter, and trade, then Monopoly is just a very long game of roulette. With negotiations players create new property combinations that alter the balance of who is favored to win the game. Players are no longer just waiting for the right die combinations. Players are actively engaging each other, sizing each other up, as they look to find trades that will give them a chance to win. The options created from trade changes the game from a game of just chance, to a game of skilled negotiations with some chance. Through negotiations players are able to keep others from running away with the win. If we can coordinate to not destroy our chance to win in Risk by fighting each other to the death than we can also negotiate to work together to prevent another player running away with a win. Using negotiation to coordinate player action to prevent a runaway leader even occurs in games where negotiations may be limited. In Settlers of Catan players will not only boycott trading with the player in the lead, they will also work together to move the robber, exchange resources, build roads, and settlements to contain the player in the lead. Negotiations necessitate personal interactions. I have to convince you to work with me. That means success or failure becomes dependent on player personalities. Are you vindictive? Are you pragmatic? Do you have trouble trusting people? Do you have trouble trusting me? Are you forgiving? These personality traits alter game negotiations and alter game experience. If you do not trust me in Risk then you might hesitate to enter an agreement with me to attack another player because I may exploit your undefended border. Just finding my personality abrasive can alter what I can achieve in negotiations. Someone might not trade with me in Monopoly because they just think I am a mean and horrible person. Different players have different personalities. Each time you play with a group of people you are dealing with a different combination that creates a completely different game experience. That means a game with a heavy negotiation element plays as a new variant every time you play it, just like Risk Legacy. Even if you play the same game with the same players, they will remember what happened last time and adjust how they treat the other players. Navigating your personality amongst other player’s personality is a game within itself. Which player can best navigate their personality strengths and weaknesses amongst everyone else’s strengths and weaknesses? Take the game of Pandemic. Players are constantly negotiating with each other to form a consensus on how to fight the epidemic. Players who do not adjust well for the negotiating strategies and personalities of their teammates will not work well together and will fail to coordinate to save the world. Risk and The Resistance shows that winning negotiations gamers are not just about building coalitions, they are also about negotiations that successfully destroys them. Players are battling each other to either build trust or destroy it. If you are not part of the coalition that appears to be winning the game then you need to use your best negotiation skills to break it up. In Risk, the player leading the game sees everyone attempting to form an alliance to counter their growing power. A good negotiator does not sit ideally by and let a new alliance form to prevent their rise to glory. They walk over to the player with trust problems and remind them of all the times the other players stabbed a partner in the back. Next, they quietly stroll over to the players who are known for stabbing others in the back and tries to make them an offer they just can’t refuse. While playing The Resistance, I need to figure out what is the best tactic to convince the leader that someone else is a traitor and not me. I weigh the success of deflecting attention from myself by attacking others, versus using such aggressive tactics backfiring and drawing attention to myself. At the same time I have to decide if vocally professing that I am not the traitor will lead more or less people to trust me. If a group challenges my loyalty I must work to undermine the credibility of those who label me a traitor and sew seeds of mistrust within the group itself. Risk without negotiations is not risk, its multiplayer chess with dice. Negotiations turn simple mechanics into an intense meta game of wits among the players. Players are no longer just trying to solve a simple puzzle, they are actively competing with each other to achieve a diplomatic victory that will hand them the game. As a student of economics I have long known the perils of the Winner's Curse in everyday life. But I did not realize the havoc wrought on Board Games by the Winner's Curse till Cardboard Edison tweeted for help on a design challenge with their game Cottage Industry. Can we prevent a player from ruining their play experience with a bad decision? How to penalize a bad choice without making the game unfun?
. @HerrohGrant What about a player blowing all their money on a single auction? @CardboardEdison @HerrohGrant In the example was spending all of their money the right thing to do tactically or a mispricing of the good? @drwictz @herrohgrant Mispricing. Overbidding early on left them with no $ (or options) later. We're talking about income to mitigate this. The Winner Curses explains why the player winning the auction in Cottage Industry was losing the game. 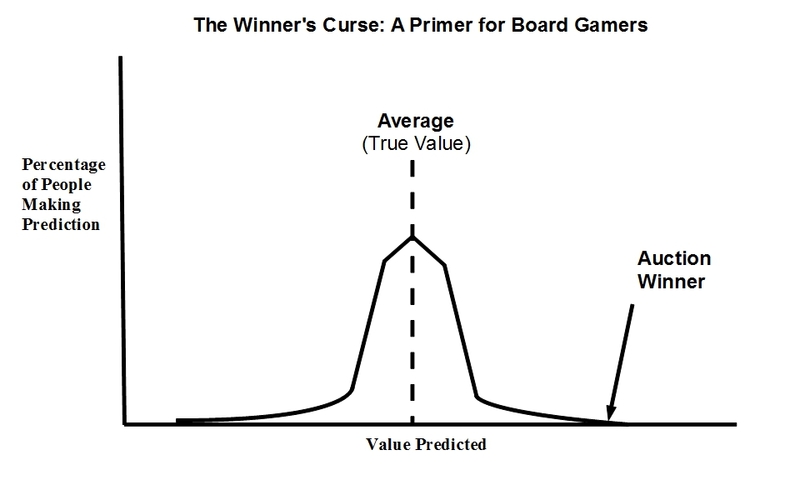 More specifically, the Winner curse explains what makes winning an auction so dangerous to a game player and why highly rational game player make the mistake of overbidding in a game. To understand the Winner's Curse, the dangers of auctions, and the risk of over bidding in a game, we first need a quick understanding of the concept of Rational Expectations. One application of rational expectation is finding the true value of something by asking a bunch of people and calculating the average answer. The assumption is that people's observations on average are correct. So, if we were to ask a large group of people how much earning an Economics PhD altered lifetime earnings, the average answer will be correct. That does not mean everyone is correct. A bunch of people are going to give a number that is way too high and another group of people are going to give you a number that is way too low. If people are on average correct, then these over and under predictions will cancel each other out when you take the average. Why does this matter for an auction and for board gaming? When you conduct an auction in a board game (1), every player makes an estimate internally on how much is something worth in the game (2). Rational expectations tells us that the average value calculated by all the players is the true value of the item up for auction. But the player who wins the auction is the player who has the highest bid. The highest bid is not the average value. Rational expectations tells us that the highest bid is the person who overestimated the true value of the item the most. So it should be no surprise when the winner of an auction in a board game suffers from the winner's curse when they overpay for an item. (1)Auction where only the highest bidder pays the highest bid. (2) We are assuming that the item has the same value to all players in terms of helping them win the game.